Jamie's new cookbook brings together 100 ultimate comfort food recipes from around the world. It's all about the dishes that are close to your heart, that put a smile on your face and make you feel happy, loved, safe and secure. Inspired by everything from childhood memories to the changing of the seasons, and taking into account the guilty pleasures and sweet indulgences that everyone enjoys, it's brimming with exciting recipes you'll fall in love with. 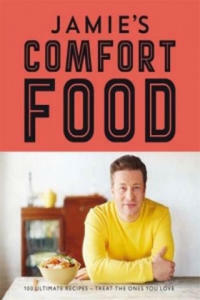 Jamie's Comfort Food is all about the food you really want to eat, made exactly how you like it. With this in mind, the book features ultimate versions of all-time favourites, and also introduces cherished dishes from countries around the world, providing a delicious recipe for every occasion. This isn't everyday cooking - this is about weekends, holidays, celebrations and occasions. Whether you're home alone, or sharing the love with a big group of family or friends, there really is something for everyone. Celebrating the beauty of good food is at the heart of this book, and it's jam-packed with incredible photography. Written in Jamie's usual down-to-earth and easy-to-understand style, the methods are precise and have been tested to the hilt, so are guaranteed to work, but this time Jamie has turned the edit filter off, and shares extra hints, tips and ideas throughout to ensure you achieve the best possible results. This is about making food the very best it can be, and embracing the rituals of cooking. Recipes include everything from mighty moussaka, delicate gyoza with crispy wings, steaming ramen and katsu curry to super eggs Benedict, scrumptious sticky toffee pudding and tutti frutti pear tarte tatin. Treat yourself, and your loved ones, with Jamie's Comfort Food. The 5:2 Diet is transforming lives worldwide. Thousands are losing weight, improving their health and saving money. Now, The Ultimate 5:2 Diet Recipe Book makes this lifestyle easier than ever, with recipes that make food on your Fast Days a pleasure. It's packed with easy, delicious dishes, from Great Start Breakfasts to International Favourites, Comfort Food, Super Soups, and even Sweet Treats. This down-to-earth guide by The 5:2 Diet Book author Kate Harrison mixes great recipes with all the humour, money-saving tips and practical advice that made the first book a bestseller. It also explains the science and incredible health benefits of this simple, inspiring approach. This cookbook focuses on fresh, delicious and fast home cooking, with meals that taste nothing like 'diet' food. It includes: . More than 85 recipes, all calorie counted, with dozens more ideas for adapting them to suit your life and budget; . 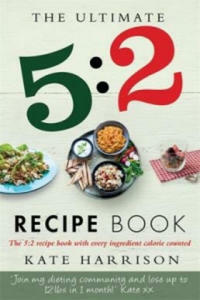 5:2 Lives: inspirational stories and honest food diaries from real dieters, who share the secrets of their success; . 5:2 Know-How: tips on everything from store cupboard suppers, time-saving gadgets and fitting 5:2 around family life and holidays; . How to 5:2: an updated, easy-to-follow guide to how, and why, you can begin this life-changing plan right now. The Ultimate 5:2 Diet Recipe Book is the only cookbook you'll ever need to help you lose weight, boost your brain and change your attitude to food forever. The Art of Eating Well is a revolutionary cookbook that will help anyone who wishes to feel better, lose weight or have more energy. 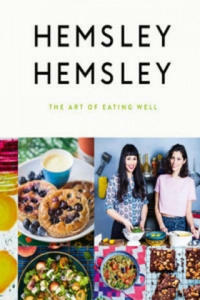 London-based sisters Jasmine and Melissa Hemsley teach their principles of life-long healthy eating with exciting and inventive recipes that are so delicious you forget the purpose is good health and nourishment. Jasmine and Melissa's philosophy is simple: a healthy gut leads to a healthy body and mind, and a better, happier you; that changing the way you eat doesn't have to involve deprivation, but can be enjoyed everyday - whether you are home, work, with family or friends, or eating out. This stunning book includes over 150 mouth-watering recipes - all of which are free from grain, gluten, refined sugar, high starch and are alkaline friendly. The sisters' down-to-earth, encouraging and practical guidance will motivate you to try new foods and no longer crave high sugar and processed foods. They include comprehensive advice on ingredients, techniques, equipment, cooking in advance, meal plans, juicing, and packed lunches and snacks that fit busy lifestyles. The Art of Eating Well is divided into clear categories - Kitchen and Store Cupboard Basics; Cooking in Advance; Breakfast; Soups; Salads; Sides and Snacks; Main Meals, including meat, poultry, fish and vegetarian; Baking and Desserts; Dips, Dressings and Sauces; Juices and Smoothies; Basics. Beautifully photographed and designed, The Art of Eating Well is a kitchen bible that delivers maximum taste and maximum nutrition. A bold and beautiful cooking companion for food lovers that will change the way to you eat leaving you energized, healthy, slimmer and strong. As a new mum, Jessica Alba wanted to create the safest, healthiest environment for her family. But she was frustrated by the lack of trustworthy information on how to live healthier and cleaner - delivered in a way that a busy mom could act on without going to extremes. In 2012, with serial entrepreneur Brian Lee and environmental advocate Christopher Gavigan, she launched The Honest Company, a brand where parents can find reliable information and products that are safe, stylish, and affordable. "The Honest Life" shares the insights and strategies she gathered along the way. 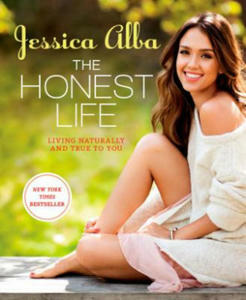 "The Honest Life" recounts Alba's personal journey of discovery and reveals her tips for making healthy living fun, real, and stylish, while offering a candid look inside her home and daily life. She shares strategies for maintaining a clean diet (with favourite family-friendly recipes) and embraces nontoxic choices at home and provides eco-friendly decor tips to fit any budget. Alba also discusses cultivating a daily eco beauty routine, finding one's personal style without resorting to yoga pants, and engaging in fun, hands-on activities with kids. Her solutions are easy, chic, and down-to-earth: they're honest. And discovering everyday ways to live naturally and authentically - true to you - could be honestly life-changing.